Meet Dahlgren officials who not only helped developed cutting edge technology, but helped deploy it for use by our armed services. 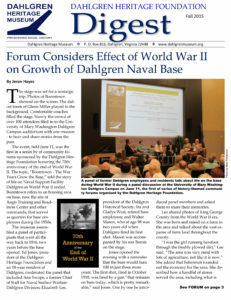 A screening of the segment of the film “Dahlgren: A Century of Innovation” that deals with this theme, followed by a panel discussion. Reception begins at 4:30 pm, program begins at 5 pm. Cost is free but donations are accepted. For more info, call the Museum at 540-663-3680.